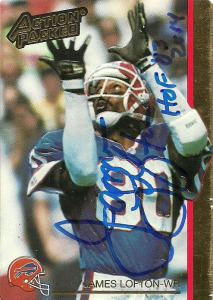 James Lofton has a great reputation as a fabulous TTM signer. His normal cost is $10.00 per flat, but like many players, he will sign for as little as $5.00 a card. 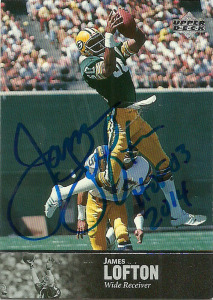 After I had gotten James many years ago in person at Dallas Cowboys’ training camp, I had piled up a significant number of really nice cards of the Hall of Fame player. 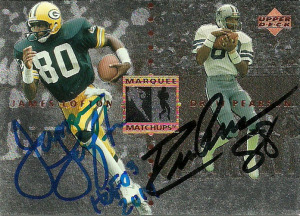 The big incentive was this really nice Upper Deck Marquee Matchups card that I had previously gotten signed by Drew Pearson in person. Spurred on by the number of responses I was seeing, I decided to go ahead and shoot a few cards out with a donation. It didn’t take but a week for the Hall of Famer to respond signing all 4 of my cards, throwing in the additional Hall of Fame card. Lofton’s autograph is slightly different from his 1992 signature. It is missing the star in the loop of the ‘J’ and the number 80 inside the ‘L’. 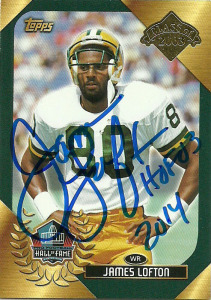 He was also kind enough to inscribe each card with his Hall of Fame year. Still it looks legitimate enough that I believe it is from him and not a ghost signer. Cards: Pinnacle 1992, SkyBox 1992. Acquired: In person, Dallas Cowboys training camp 1994. 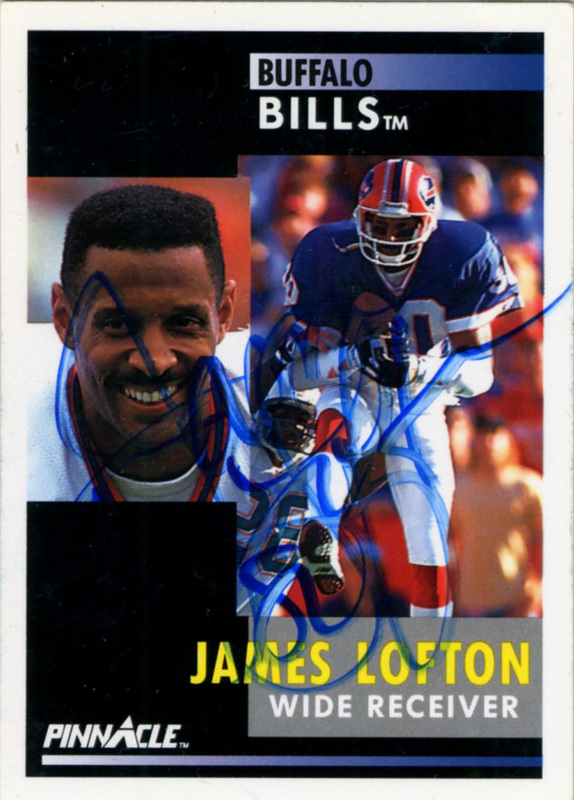 In one of my more infamous moments of autograph collecting, James Lofton had signed as an interim coach with the Los Angeles Raiders in 1994 and was in Austin to scrimmage the Cowboys. Knowing that I would probably only get one shot at the wide receiver I got the prime spot in the autograph alleyway that players had to walk up to get to the field, and then waited. 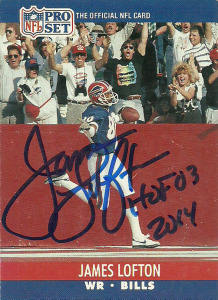 When the players arrived, I unfolded the cardboard sign I had with me that stated,”WILL WORK FOR JAMES LOFTON’S AUTOGRAPH”. Every player who got off the bus chuckled at me and then when James got off, (while he was being ribbed by his teammates,) walked over, smiled and gave me his autograph on the two cards here. 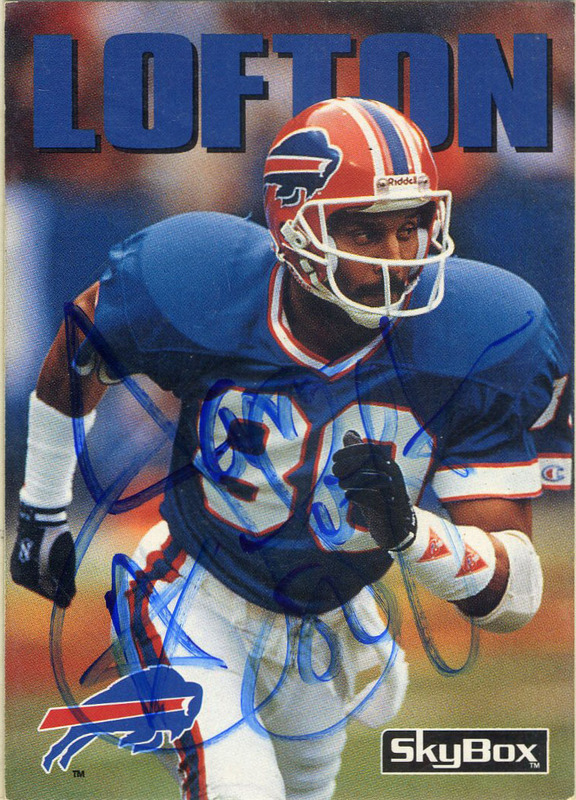 A player whose career literally spanned three decades of football (70’s, 80’s & 90’s) and one of only a few players to score a TD in each era, Lofton was a 8 time Pro Bowler, and a 4 time All Pro for the Packers and Bills. (Drew Hill scored in each era one game sooner for the honor of doing it first.) 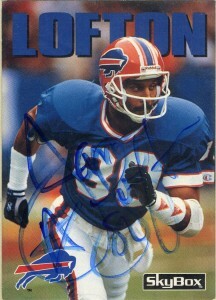 Inducted into the Hall of Fame in 2003, Lofton played Packers, Raiders, Bills, Rams and Eagles, during his career retiring at the age of 38. Lofton has coached in the NFL with both the Chargers and Raiders, and as of 2010 serves on Westwood One Radio’s Sunday Night Football broadcasts.